When setting a custom keyboard shortcut for alignment (e.g. Alt+Cmd+B for aligment to Bottom), the alignment itself is applied always with respect to selection bounds. 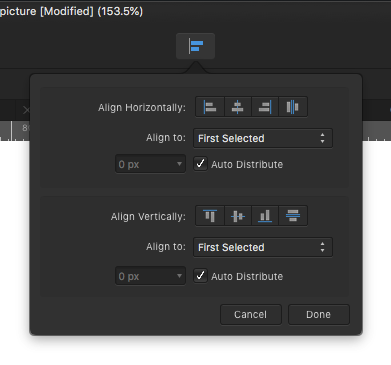 However, in the alignment settings pane, the "Align to" option is set so as the alignment reflects "First selected" element. This is by design as the shortcuts are for the Layer > Arrange menu which always aligns to Selection bounds. I think it is nice that we have choices. And sometimes having a default is easier to remember than what ever it was you set last time you used the tool. @Callum, @Old Bruce I see your point. Unfotunately, I have never found any real use case for "selection bounds" alignment. It may be because of my "deformation" from other tools (like Axure RP, or even Photoshop some years ago), where there you always align to first (or last) selected element. And it seems to me quite convenient as alignmnent is predictable, clear and fast (using keyboard shorcuts). Actually, in my workflow during app design (pixel-perfect results with often quite small elements are needed), it's really confusing to use alignment to "selection bounds" as this produces undesired results in 99% of cases. For example, usually one element is already placed where it should be, then you add more elements somewhere into the design and need all of them to get vertically centered with the first element. Aligning to "selection bounds" simply does not do it. I admit that it may be only my point of view, but I'd be grateful for some insights on this. Maybe I'm getting the whole "selection bounds" alingment thing wrong. Is it useful in other workflows, like drawing or print design? Okay I see what you mean and I agree with you. It would be great if we could choose in the preferences which behaviour was the default. Personally I may never use it but that is because I am used to a less efficient work flow of my own design. [smiley-face emoticon] I can see changing it though if this was available.